Product prices and availability are accurate as of 2019-04-16 21:02:09 EDT and are subject to change. Any price and availability information displayed on http://www.amazon.com/ at the time of purchase will apply to the purchase of this product. The high speed 33.6 kbps modem built into the Panasonic KX-FL421 is designed for super fast and efficient document transmissions (up to 4 seconds per page1). The built-in Junk Fax Prohibitor feature helps prevent unwanted faxes from being received and wasting valuable toner and paper. 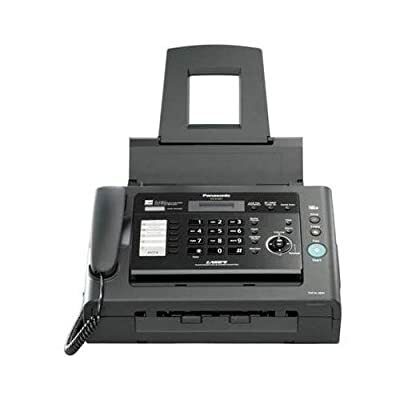 The KX-FL421 fax machine is Caller ID3 compatible so you can see who's calling before answering. Utilizing the devices 2 line by 16 character LCD display, you're able to see the name and number of your incoming callers. You can even display and print a list of Caller ID activity. All of this adds up to a great time saving feature for both business and personal use. 2. Based on letter size paper. 3. Requires subscription to Caller ID, a fee-based phone company service(s).